Episode 4.2: Geek Gads-The Finale! Tomorrow I will post a follow-up blog with a text recap complete with links to all of the products so that you can explore them further if you are interested. In the meantime, if you have any questions or comments, please email me or post them in the comments below! Production starts next week on the next video podcast...I won't reveal the topic just yet, but I promise it will be fun and, well...geeky! New Video Podcast! Episode 4.1: Geek Gads! It's here! Part 1 of Episode 4 for your viewing pleasure. I had so much to say about my favorite gadgets that I had to split this podcast into 2 segments. Part 2 (or Episode 4.2) will be up by tomorrow night. In the meantime, enjoy the first part, and be sure to send me your feedback! And, I got so many responses from you all, that I read some of them at the end in Episode 4.2! Keep checking back this morning...the second the episode is live you will have it here first! I am going to talk about 5 gadgets that I love, and expect the unexpected here. I'm sure lots of people will say their iPhones, iPods, etc., which is great, but I want to also hear about other things that you all love. Then, I want to reveal to you all if there is one response that is overwhelmingly universal, or if I get any wacky responses, I might share those as well! Email me your answer to geek.girl@earthlink.net. Put the word "GADGET" in the subject line. OR, post it in the COMMENTS section below. Hope to hear from you! Otherwise, come back for the new podcast tomorrow night/Tuesday morning! Wow, is it really November? Oh yeah, and STRIKE! WOW. I can't believe it's November. 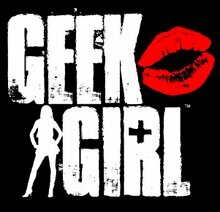 I haven't blogged in so long, but have no fear, a new GEEK GIRL production schedule is here! I have been getting so many emails from all of you with questions and comments...I hope that the advice I've given has worked out! Make sure to send me follow up emails. Quite a few new episodes are in progress...and now that I got a nifty new laptop with the iSight built-in, I can change locations and shoot the episodes outside of my office! We're mobile, people...it's official. If you have any feedback or just want to say hi, please feel free to post below in the COMMENTS section! Or, email me your thoughts, questions or even videos, at geek.girl@earthlink.net.